I woke up for the day at around 4:30AM. I read in the dark for a little while before getting up to shower and dress. While Kristin and J got ready, I ate my granola bar and drank some water. I made sure that I had my fuel and pre-race banana, and packed my Hips-sister for the day. I was thinking about leaving my hooded jacket but at the last minute decided that it couldn’t hurt to bring it, especially since the temperature was supposed to drop about 10 degrees in the next hour. We headed down to the lobby to wait for the shuttles. The Ritz provided complimentary coffee (although, poor things, they were hard-pressed to keep the runners supplied), but I passed. It would have been nice to have something warm, but coffee and I are not on great terms. Being a cruel friend, I made Kristin join me outside to get a feel for the temperature and to admire the sunrise. We hopped on the third or fourth shuttle and headed to the start line, on the waterfront. I’m going to be pretty honest. It was freezing. I couldn’t get warm. We were only waiting for about 25 minutes, but my teeth were chattering, and even though a huge drip of us were huddled around some kind of fenced-in electrical box, the cold air was cutting. We met up with some of the other ambassadors, ate our last-minute snacks, hit the portapotties, and checked bags: all the final preparations before a run. And then, blessedly, it was time to line up. The National Anthem was sung, final instructions were imparted, and we were off. The course was gorgeous. I wish I had enough feeling in my fingers to be able to run with my camera a little, but that was a no go. We left the waterfront and headed through some neighborhoods in downtown Fernandina, running over a bridge before cutting into Fort Clinch State Park. We spent a long time in there, winding through the dense trees, before looping out to the beach and back. There were high dunes on one side and forest on the other. So scenic. Finally, with about four or five miles to go, we exited onto A1A and began the long, straight trek back to the Ritz. The grand finale was about .3 miles on the sand. We were hoping for packed sand, but… it didn’t quite work out that way. I’ll be honest, my beach run does not rank among my more graceful moments. This was not a PR race for me. The cold and wind were major factors. I had to shed my jacket at about mile 4, more because of the drag than because I had warmed up. I really didn’t get feeling back in my feet until we were in the park, and while I had to ditch the fingered portion of one glove midway simply because I couldn’t open the zippers in my belt to get to my fuel, I ran with gloves til the very end. I also had to go to the bathroom (from the cold), but every time I stopped to use a portapotty, someone hopped in and I hated standing there, losing precious seconds. I trekked along, concentrating on my intervals and staying warm. There were aid stations about every 1.5 miles, offering water and Cytomax. I started with the water for the first few stops, and then switched. There weren’t a lot of spectators along the course, but the volunteers who manned the water stops were so friendly and encouraging. Huge thanks to them all for braving the cold to support all the runners. At about mile 10, I came up on A. It was her first half marathon, and she had been hit by some tummy issues during the night. It must have been awful for her, but she was powering on like a beast. I really wanted her first experience to be as good as possible, so I buddied up with her for the duration. I chattered incoherently to keep her focused, and when my calves had had quite enough of the small, rolling hills, she started cracking ridiculous jokes to distract me. Perhaps the greatest moment of the day was when we hit the sand and she began belting out Katy Perry’s “Roar.” Epic. I think I was happier for her to cross the finish line than I was for myself. It’s so awesome to watch other people achieve their goals. we headed up the stairs and boardwalk to the main lawn of the Ritz, for the post-race festivities. We were a happy group. So happy, we had to jump! These ladies were all so wonderful and encouraging. Several of them had absolutely epic PRs, but we all ran great races. I was so proud to be a part of this group. My only regret is that we didn’t have more time to hang out together. There were rumblings of meeting up for another race. It would be great to make that happen. We said our goodbyes and wandered through the after party. There were delicious snack boxes and Barefoot Wine. Mats with foam rollers next to coolers of Muscle Milk. Singers on stage and shopping at booths brought out from Friday’s expo. Inside, there were recovery yoga classes and staff from the Ritz-Carlton spa were offering complimentary massages. And check out this bling. Before we left, we went down to the finish line one more time to cheer on another friend who was completing her first half marathon. 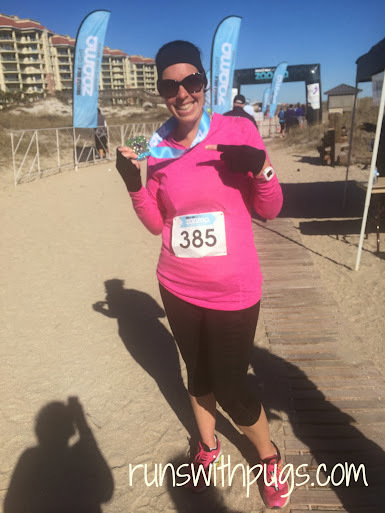 Huge congratulations to K and to everyone who ran their first race, half or otherwise, at Amelia Island on Saturday. and drove back towards the waterfront for a late lunch. A had mentioned that Tasty’s was the place to go for burgers and shakes, so we went. We got milkshakes for the hour-plus drive home, and agreed that we would be back with the families. It was that good. 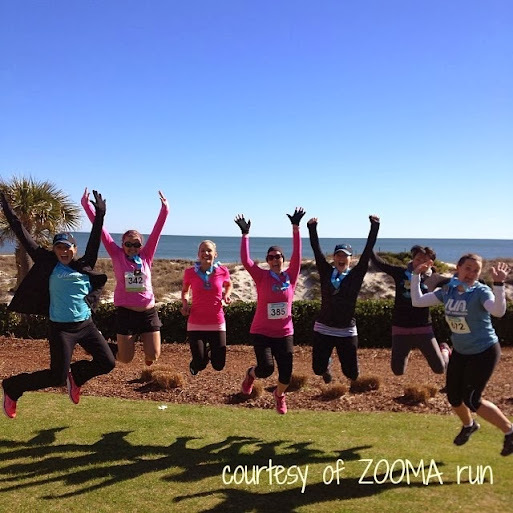 I loved this ZOOMA race weekend. I loved the idea of getting away with some girlfriends, even for just an overnight. I loved the venue and the course (few places can compare to the Ritz-Carlton, and staying there just added another level of incredible to the overall experience). The staff and volunteers worked so hard to make sure this was a quality event. The swag bags were among the best I’ve ever received, the vendors were top-notch and involved and everything just fell into perfect place. I would return to this race in a heartbeat, regardless of the cold temperatures. Thank you, ZOOMA, for a great race and an unforgettable weekend! Thank you, Kathy. It’s not quite a year, yet, but it’s close! Your support has meant a lot! Congratulations 🙂 IT looks like I missed a fun time. I was supposed to spend the weekend with Bam Bam, but things changed…and I came down with Bronchitis anyway, so it’s probably good I didn’t sign up for the race! Ugh. Bronchitis is going around like wildfire! I hope you are feeling better! I need to catch up with things in your world! This sounds like such a great event! They host one near me (kinda) but it’s a little pricey. Might have to save my pennies though, sounds like such a good time! You know, the registration price is on the higher end of the spectrum, but for me it would be worth it. I loved all the little details that you don’t get in your average, less expensive race. This is more of an experience and an event than just a basic run. If you don’t have to worry about a hotel night, I would definitely recommend trying to give it a shot. I don’t think you’ll be disappointed. It’s a few hours away so would have to stay over. But it’s not until September, so there’s time to save up! Sounds like a great time! I’ll definitely be adding this race to my bucket list. It’s my birthday weekend, so I’m sure one year I’ll talk my girlfriends into a race-cation to celebrate with me. What a great birthday weekend that would be! And spending that weekend at the Ritz? Even better! 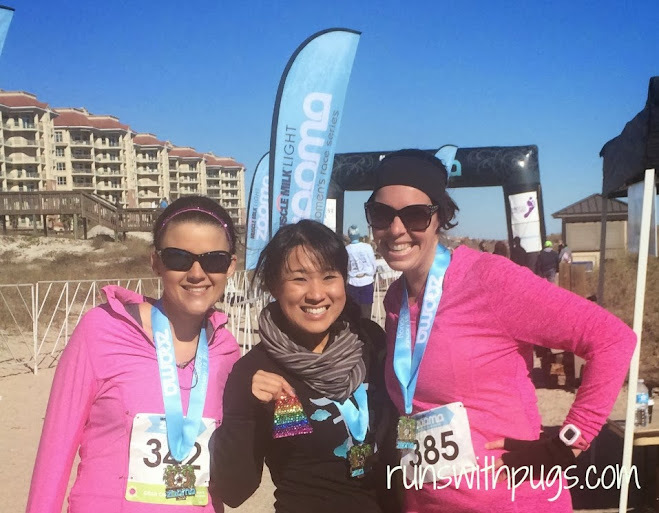 runswithpugs recently posted…where do I go from here? Such a fun time, I’m so glad we got to do it together! Me, too! Here’s to many, many more! Sounds like it would be a great place for a runcation. The Zooma races seriously look fabulous! It looks like you really enjoyed your race, I am so glad it went so well, and it looks like it was a beautiful day despite the chilly start! My experience was seriously awesome. I loved almost every minute of it! I love hearing everyone's journeys and seeing everyone's successes. I think we all have great things in our future! I hope we can do it again! Looks like loads of fun, though running on the beach is my nemesis! I ran the Donna last year and it was 28 degrees at the start….and the wait was forever…so I know your pain. I like running in cold, so who knows. maybe this could be a race for me. I do not usually go for exclusive, womens only things, but…I never thought I would do Donna, and did to support a friend and ended up loving it! Glad you had a great experience, and who wouldn’t with NEW Altras!!!! Mizunogirl recently posted…Runner opinions wanted. This isn’t a women’s only race – there were a few men in the mix. The event is geared towards women, though, which was nice, especially with the items at the expo and in the swag bag. Definitely give it a try next year!